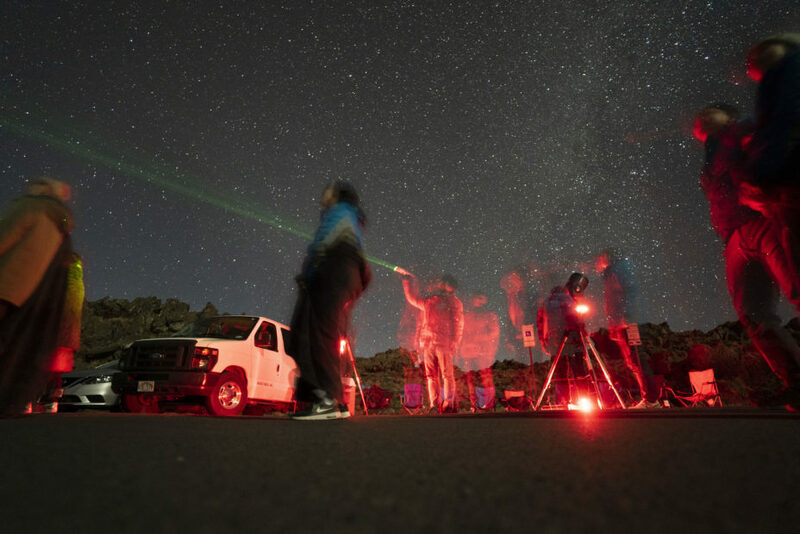 Youshikazu Yamauchi points out stars with a green laser for his “Maui All-Stars” star gazing tour. (Click on image to enlarge). The great thing about being in a national park is that you meet all sorts of visitors who come for all sorts of reasons. Three times I’ve met up with Yoshikazu Yamauchi, who runs a business called “Maui All-Stars”. His card says, “Haleakala Sunset & Stargazing”. I’ve seen Yoshi at the Kalahaku Overlook, my favorite spot and I think his, too. A few weeks ago I saw a telescope set up in the small parking area I usually go to and saw a van of people. I started talking to the driver and found out he is Japanese, but moved to Maui and now leads stargazing tours, mainly for Japanese tourists. I told him what I was doing and he seemed impressed I came all the way from New York and I think told the 8 or 10 visitors about me. (I think he was a little disappointed I didn’t speak Japanese). A week later I saw him at the same spot, he was setting folding chairs out for everyone. After tending to his guests, he offered me a cup of hot green tea. He gives the tours in Japanese, all while soft, mainly Hawaiian music, plays from the van. I’m familiar with some of the sky, so I could follow a bit of what he was describing to the people. He uses a green laser to point out stars and objects in the sky. I looked through the telescope and binoculars Yoshi had set up and got some nice views of star clusters, a galaxy and the moon. I saw him and his group a third time a day before the full moon as they watched the sunset. The moon rises and moon sets here are remarkable for many reasons. Usually clear views from the high altitudes and incredible colors in the sky are two. Standing high on a lone mountain in the middle of the Pacific Ocean is another. The first two pictures below were taken on the vernal equinox, March 20, 12 hours and 8 minutes apart. 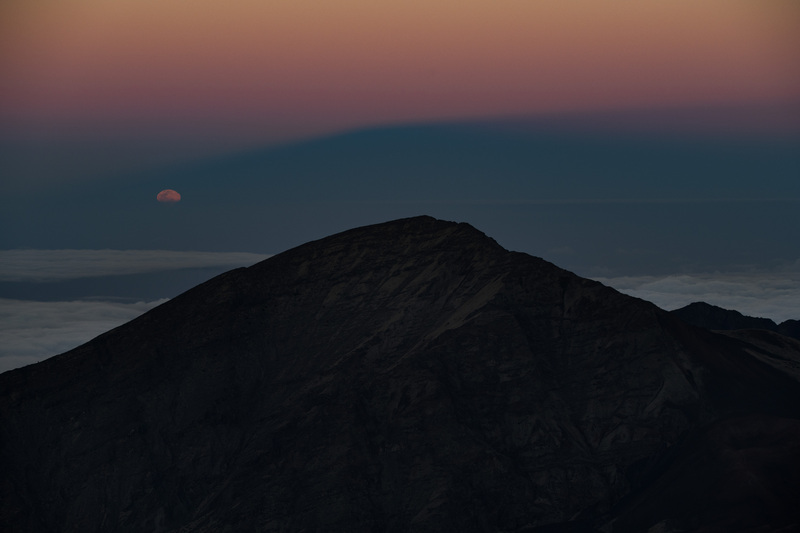 Both show an amazing phenomenon of the shadow of the Haleakala mountain being projected to the direction opposite the rising or setting sun onto the hazy atmosphere of our Earth. 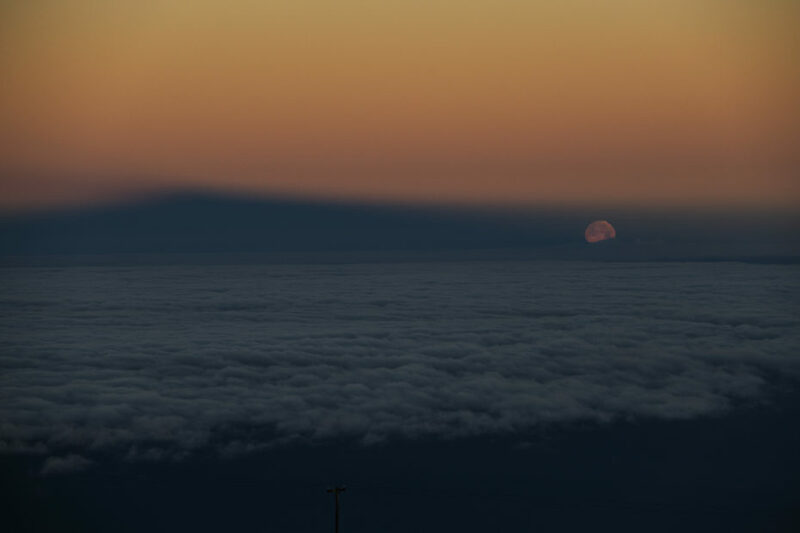 The first shot shows the moon setting early Wednesday morning at 6:30 am, tucking in behind the island of Lanai with the Haleakala shadow to the left. This is from the summit area, just below 10,000 feet in elevation, above the cloud layer. 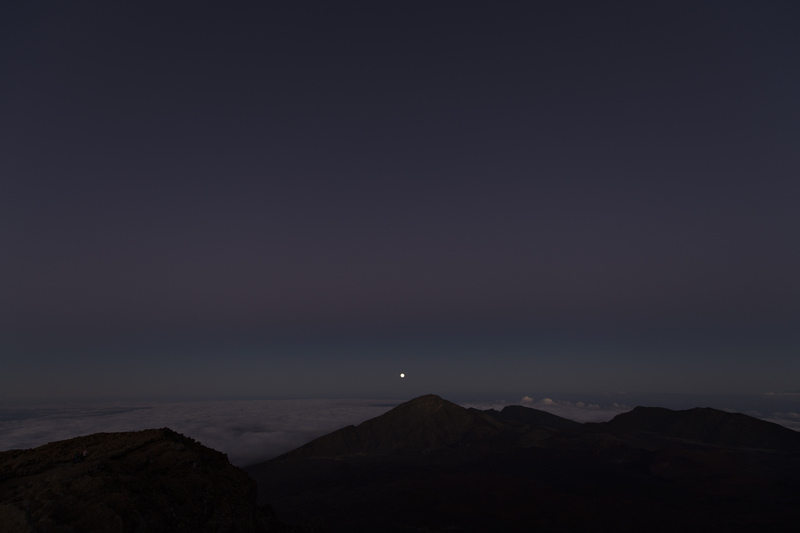 The second shot is that evening at 6:38 pm, from the Kalahaku overlook, the full moon just breaking the horizon, rising through the shadow of the mountain and the shadow of the Earth. Hanakauhi, the mist maker, is in the foreground. Fortunately, no mist to be seen. This is really a sight to be experienced. A third moonrise shot taken minutes after the one above is more abstract and gives you the sense of how vast the environment is here. March 20, 6:30 am, moon set from summit area. (Click on images to enlarge). March 20, 6:38 pm, moon rise from Kalahaku Overlook. March 20, moon rise from Kalahaku Overlook. The photo of 6:38 p.m. is so beautiful! Four different layers of color, plus the lone disc of the moon peeking up pink. You night owls get to see such special things. Thanks for sharing with the rest of us non-owls.